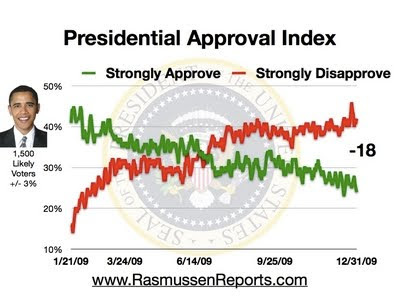 President Obama has ended 2009 with a -18 rating in the Rasmussen Presidential Approval Index. In Rasmussen's final poll of the year, only 24% of those surveyed "Strongly Approved" of Obama's performance as President, while 42% "Strongly Disapproved." In the overall numbers, 46% approved of his performance and 53% disapproved.